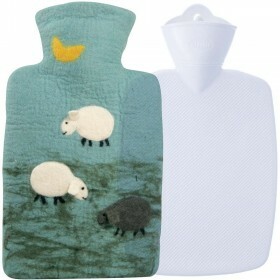 Give only the best to your child and keep them warm with a truly unique ECO hot water bottle in a cute smiley cover. It is the absolute top quality made in Germany and safe to use by little kids. Unlike conventional rubber heat packs, Hugo Frosch hot water bottle is made of high quality thermoplastic from over 90% sugar cane. It is free from rubber, PVC or plasticisers. Patented safety fastener makes it leak-proof and baby-friendly. 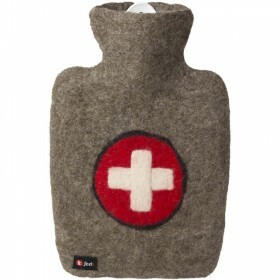 Every hot water bottle comes with to years warranty and is a pleasure to use. The shell feels hard when empty and becomes pleasantly soft when filled with hot water. Super cute cover with a smiley design closes with a velcro on the back and can be easily removed and washed. It's a fantastic gift for a baby shower, a beautiful accessory for the nursery and a lovely toy to keep your little one engaged and warm and the same time. Hugo Frosch ECO hot water bottle with a super cute smiley cover is the most innovative and eco-friendly creation for little children to keep them warm and comfortable when temperatures drop. What makes is so special is safe use proved through a series of independent tests and two years warranty against leaks. The hot water bottle is expertly crafted in Germany where winter can be really harsh and cold, so you can trust the hot water bottle will work perfectly to help your little wonderer explore the world with insatiable interest and amazing comfort. The shell is made of eco sustainable thermoplastic from over 90% sugar cane and is an additional advantage for nature-concious parents. It is tested according to ASTM (American Society for Testing and Materials) standard D6886 and is a proven Eco product. 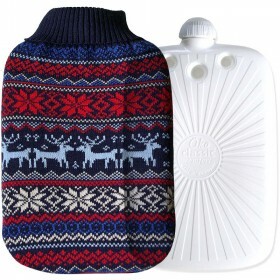 The hot water bottle comes with a patented safety fastener and does not contain PVC or plasticisers. Very soft fleece cover is irresistible to the cuddle and no doubt will become the favourite playmate to your little one. The cover is easy to remove and can be washed at 30C. Shell size: approx. 20 x 14cm plus funnel. Trust the best quality ECO hot water bottle close to your child's skin and let them confidently explore the winter world.